A festive and delicious sparkling peach eggnog punch for the winter holidays. 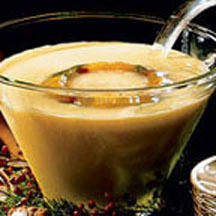 In punch bowl, combine eggnog, carbonated beverage and nectar; stir to combine. Float small scoops of ice cream in punch; sprinkle with nutmeg. Variation: Substitute cream soda carbonated beverage for peach-flavored carbonated beverage.